“A 15 minute ride will not help you decide if ‘this is the one.’ You really must ride at least 10 miles to gauge if the saddle has the correct amount of cushion and support necessary for your riding style. Cycling is a no-impact sport on your body’s joints, but that doesn’t mean certain parts of your body are totally comfy. You have three points of bodily contact as you pedal a bicycle, your rear end, your hands and your feet. ν Have you taken the time to acclimate your posterior to the feel of the saddle? A 15 minute ride will not help you decide if “this is the one”. You really must ride at least 10 miles to gauge if the saddle has the correct amount of cushion and support necessary for your riding style. The more miles you ride, the more support you will require; for less miles, more cushion is fine. Saddle support is derived from padding, density and type of the saddle’s frame support and how the frame rails are attached. And you can guarantee that every saddle manufacturer has an opinion of what is best. Every time I get a new mountain bike, I get the same saddle I’ve ridden on every bike I’ve owned. While on my road bikes, I’ve had numerous models and rarely ride the stock saddle. Everyone’s shape of sit bones and sensitivities of their “fleshy parts” are different; hence you have a plethora of different saddle widths, thickness and type of padding, length and shape of the saddle nose and the materials used. And in the end (no pun intended) it could be you just need a new padded bike short and some chamois cream. Compression of your wrists’ ulna nerve is the primary cause of your fingers tingling as you grip your handlebars. Choose a glove with gel padding and test it on a handlebar before you purchase. You can also slightly change your grip position on the handlebars to reduce the pressure and increase blood flow. If you are not riding with cycling specific shoes, all I can say is good luck! Almost a quarter of the bones in your body are in your feet. Along with 33 joints, 20 muscles and up to 40 tendons. It’s no wonder our feet hurt! 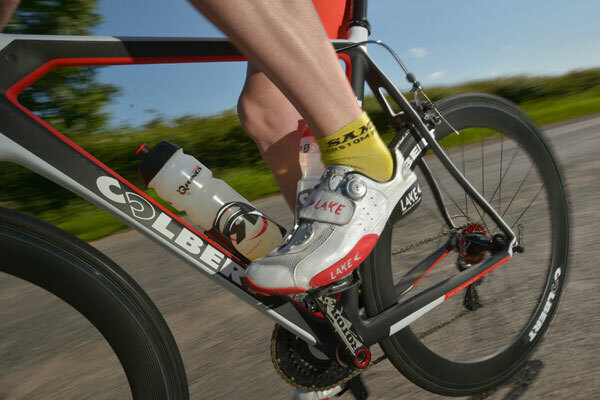 A bicycle shoe has a snug fit and very firm outer sole to help put the most efficient power to the pedal. Ride with a running shoe (which has very cushioned out sole) and you’ll feel as if someone snuck a heated pebble under the ball of your foot. A custom or better insole may help to alleviate pressure. Get the right fit, the right gear and get outside and ride!